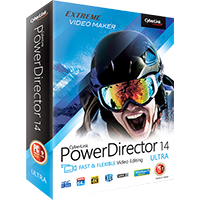 CyberLink PowerDirector 14 is the latest edition of this popular, feature-packed video editor. The program includes everything you need to create professional videos. There's a 100 track timeline to organise your movie; more than 500 effects, transitions and objects to apply; smart filters to stabilise shaky camera work, remove noise and fix lighting issues; powerful audio tools, excellent 3D support, and a huge selection of export options: DVDs, Blu-rays, a host of video formats, direct uploading to Facebook, YouTube, DailyMotion, or your own 20GB of CyberLink cloud storage (free for one year). You also get a PowerDirector Mobile app for Windows and Android, great news if you don't want to wait until you get home to start editing. That would be impressive enough all on its own, but PowerDirector 14 takes the franchise even further with some interesting new and enhanced features. The template-based Express Projects module makes it quick and easy for anyone to produce quality videos. New motion tracking support enables the accurate tracking of people and objects in video footage. Add a title, apply a special effect, maybe insert a PiP object and it'll automatically follow the target. The Action Center is a single module where you can quickly stabilize shaky footage, correct fish-eye distortion, fix colour problems and apply slow motion, freeze and zoom effects. There's a surprise bonus extra in the screen recorder, a simple way to record your desktop in up to 30fps, with audio. Whatever you're doing, CyberLink's enhanced SVRT 4, TrueVelocity 5 Rendering Engine and extended hardware encoding support ensures the best possible performance - even if you're using new ability to render 120/ 240 fps video. PowerDirector is available in multiple versions. PowerDirector 14 Deluxe is the baseline edition. It includes the core features we've described here, but drops Motion Tracking, the Action Center, MultiCam and Transition designers, 120/ 240fps video production and CyberLink's cloud storage, along with some templates and effects. PowerDirector 14 Ultra is the edition we've described here. 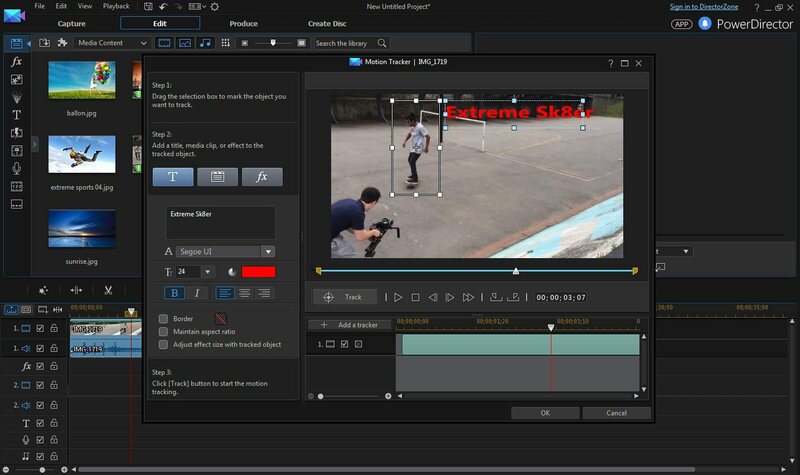 PowerDirector 14 Ultimate is the next step up, extending the program with more content packs, NewBlue Video Essentials 7, NewBlue Titler Pro 1, proDAD VitaScene LE and proDAD Adorage 1. But if you can afford it, PowerDirector Ultimate Suite has everything in PowerDirector Ultimate, adds the applications AudioDirector 6 and ColorDirector 4, includes CyberLink's Travel Pack 2 and NewBlue Video Essentials 5, and doubles your cloud storage to 40GB. You will receive the full build, with PowerDirector 14 Ultra content packs, Content Pack Essential and Content Pack Premium, after purchase. The download on this page is the trial version. You will receive the full build, with PowerDirector 14 Ultra content packs, Content Pack Essential and Content Pack Premium, after purchase.